By Courtney Fishman . Published on August 10, 2015. Digital platforms are doing their part to participate in the conversation around positive body images, and that's changing the game for marketers, particularly diet brands. Skinny, curvy, thin -- all words that can be completely innocuous, but are charged enough that digital platforms are taking steps to ensure they're being used responsibly. For example, companies like Instagram and Tumblr are creating pop-up warnings on search terms like "skinny," which could showcase unattainable weight goals. On Tumblr, a user who searches "skinny" is directed to a message asking "Everything Okay?" Below that query, a user will find the numbers for the National Eating Disorder Association, or NEDA, and two crisis intervention lines, as well as links to inspirational posts elsewhere on the site. For Instagram users, an advisory message pops up, giving users the option to learn more about eating disorders. Still, striking a balance between encouragement and intervention can be difficult. Last month, Instagram banned the search term #curvy, saying it was being used for sexually explicit images. A public outcry followed and the hashtag was reinstated. "The Instagram community cares for each other, and is often a place where people facing difficult issues such as eating disorders, cutting or other kinds of self-injury come together to create awareness or find support. We try to do our part by providing education in the app and adding information in the "Help Center," so people can get the help they need," Instagram said in a statement to Ad Age. Tumblr has taken a different approach, choosing to provide educational resources without blocking content. Liba Rubenstein, director of strategy and outreach, said that Tumblr is "not shutting down expression around fitness," but "encouraging body positivity as much as possible." In May, the micro-blogging platform started an open dialogue through its campaign, "Post It Forward." Building on organic posts from Tumblr, the campaign is a collaboration of users posting inspirational stories and experts who can help people struggling with eating disorders or other issues. "It is a big umbrella brand to talk about this whole ecosystem of issues that, for a lot of our users, very much intersect," said Ms. Rubenstein of "Post It Forward." "We'd rather nudge people in the right direction, and make sure they have the opportunity to be connected to positivity and support, rather than making more rules." Rules dominate at Facebook. After forging a partnership with NEDA in 2011, the social network created a "no idealized body" advertising policy, which bans paid posts promoting product with idealized results, as well as before-and-after imagery. While implementation of those guidelines marked a major milestone in the fight for more realistic advertisements, it's also proved challenging for companies like Weight Watchers. The industry giant has long emphasized customer success stories through before and after photos. While Lauren Salazar, Weight Watchers' director of social media, said the company has been "aware of the policies" and has "never been banned," they have had an impact on the brand's advertising. "We definitely have a perspective that before and after photos are an incredible way to recognize our member's achievement and acknowledge the amazing results that we've help them accomplish … so that is definitely a challenge," Ms. Salazar said. In order to meet Facebook's requirements, the company has expanded its messaging, showing daily diet updates rather than posting side-by-side pictures of customers' results. The company also monitors customers' use of the hashtag "weight watchers," which helps it to generate more expansive stories that follow a person's day-to-day progress. Other marketers have been caught off guard by Facebook's rules. Vest Advertising, based in Louisville, Kentucky, had an ad for a local hospital banned for prominently featuring a scale. The post was an attempt to raise awareness about gaining weight in college, but was removed for promoting an idealized message. "We were very excited about the post, because for content writers, it can be challenging to find new content and we thought this was unique," said Ben Hill, Vest's strategy director. 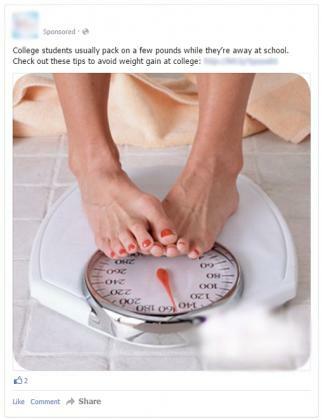 "The text of the post was pretty straightforward, something like 'college students usually pack on a few pounds while they're away at school, check out these tips to avoid weight gain in college,' and we had a link that went to an article on those tips." Facebook did not comment on that specific ad, but said in a statement to Ad Age that it wants "to ensure that ads do not cause negative experiences on Facebook, and ads containing these type of images intend to make people feel bad or self-conscious about themselves. We know this because ads like this lead to significantly higher negative feedback." John Barker, CIO for Barker Agency, which handles creative for Slimfast, said that companies need to take responsibility for widening the conversation around attainable beauty. Since Slimfast's rebrand in May, the company has made a commitment to not retouch ads, focusing more on "celebrating real people" and "real bodies," which aligns with Facebook's requirements. "We're a progressive industry and we represent progressive consumers, and we need to take the mantle toward ushering in this change," said Mr. Barker. "We have to make sure that there is a realistic balance between what is aspirationally possible and what is unattainable and psychologically damaging." Even without a restrictive policy at Tumblr, Ms. Rubenstein has found that "advertisers that are playing into those kinds of messages [of positivity] are the ones that are going to perform the best." She cites Clinique's #FaceForward and Nike's #BetterForIt as two campaigns focused on body image that have been popular on Tumblr. "There have been some important strides," said Claire Mysko, NEDA program director, of companies showcasing more attainable body types in advertising. "And I think what we need companies to understand is that positive messages, like this, can be profitable."